Monsieur Truffe's Chinese Lantern Block is created for those wanting to spice up their tastebuds: 72% Dark Chocolate with Freeze Dried Raspberries, scrumptious Caramalised Birdseye Chillies and a dash of Chinese Pepper for good measure. Some like it hot and believe us, every bite will be like firecrackers exploding in your mouth! Vegan friendly, Organic, Fair Trade and for those with an adventurous palate. SOLD OUT! 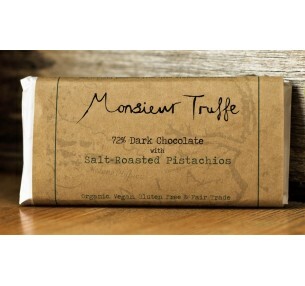 Monsieur Truffe's Cherry Pie Block combines intense 72% Dark Chocolate with tasty f..